You may laugh at that, but for now it is my life-blood. In Kansas City, my “office” was a Starbucks. I regularly sipped my caramel latte with new church members and potential kid ministry volunteers. My ears were met with the heartbreak of people searching for meaning- answers in their lives- while we bonded over pumpkin-flavored, well, everything. Tears have been shed over the deep pain of others, dripping down to the “reclaimed wood” tables we steadied ourselves on, giving me a unique and blessed look into the heart of another. I have spilled my feelings out for my accountability partners, and they have lovingly guided me toward the words of Jesus for answers. It is amazing what life-change can happen over coffee; there is love that comes alive between two people who share a common hurt. Loving another in their pain isn’t easy, but it is right. My Starbucks meetings took away the labels: church staff member vs volunteer, Christ-follower vs non-Christ follower, male vs female. It gave me the opportunity to be on the same playing field as my ministry leaders, “bosses,” and friends. Across the table from each other, our problems and failures look the same. We are all trying to do our best with the life that has been given us. 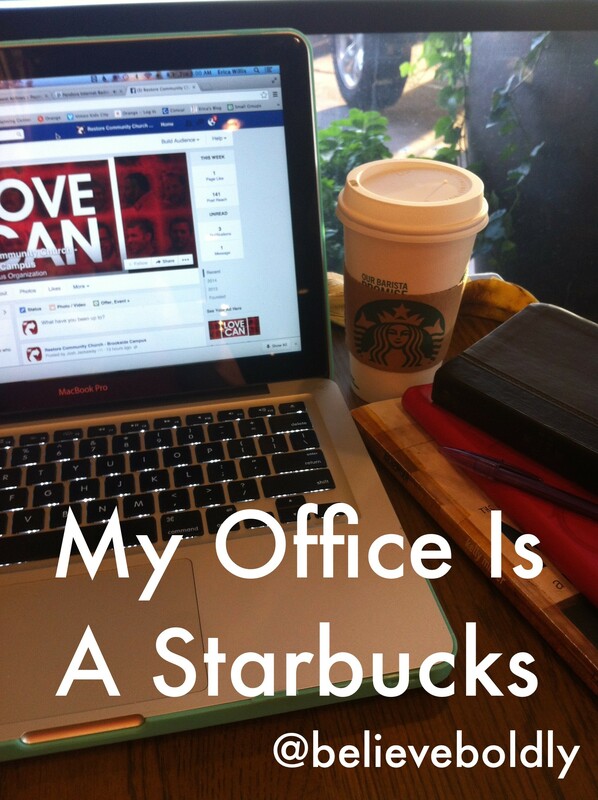 It didn’t matter whether I worked for a church or not (much of my time meeting in a Starbucks, I wasn’t on staff). It didn’t matter whether they believed in Jesus or not. Their pain was my pain, my struggles theirs. And as I sit in a Starbucks every morning in a new town with new people, it can be lonely. It can feel like that old Starbucks and its comfort is lightyears away; that the work God was doing there could never happen in another place; that I will not find another “people” to love the way I did the people of Kansas City. God is just as real in my life now as He has been the past 6 years. The people that come in and out of the doors of this new coffee shop are searching for meaning, too. We are all called to a high purpose and if coffee opens the door for those conversations, I am thankful. Some day I will listen to people again and see the faithfulness of God play out in their lives. I will challenge and discuss thoughts about baptism, death, heaven, serving in the church- sharing in hopes and disappointments. Why? Because God calls us to love each other with an unfailing love, full of grace and seasoned with encouragement so we can be examples of Christ. How are you showing love to others? Did someone make a difference in your life by taking the time to listen? You were such an encouragement to me when struggling in my marriage and when becoming a mom. You listened and gave up your time to encourage me! Our small group was talking last night about how we can live in Community with each other beyond our Monday night dinner and discussions. We need to tear down the walls we put up around us and let others in so they can help us and we can help them in return. That is so true! Sometimes it is hard to open up and be vulnerable, but sometimes God uses our openness to transform someone’s life. And believe me, you changed me in return! I wish we would’ve had more time for Starbucks talks 🙂 You rock!!! It is selfishly nice to hear that we (the people of KC are missed). While reading, I pictured a Starbucks meeting with you and there were tears. Oh how much God has done! I am 100% sure that your “people” are emerging there. Oh, Janet. You put it so nicely- “there were tears”… How ’bout “ugly-cry-face-can’t-breathe”tears?! I think I terrified the people around us. Thanks for listening OH SO MANY TIMES since then!